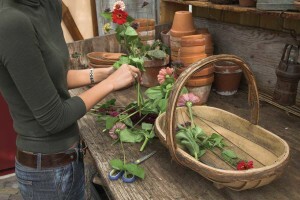 A potting station can be a creative project that pays off in terms of gardening ease. It’s hard not to covet the potting stations we see at nurseries, especially when we drive home with soil and flowers and ponder the project ahead: lugging pots and garden tools from the garage, mixing soil and compost, filling pots, digging holes, transplanting flowers. Then there’s sweeping up the dirt and putting away the tools. Planting is a fun project, for sure, but a potting station can make it an easier one. 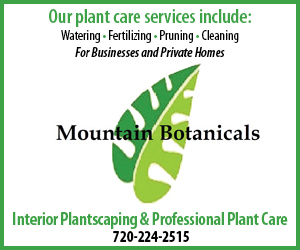 The basic elements of any decent potting bench include a base, a work surface and shelves, says Connie Smith, manager of Boulder’s Sturtz & Copeland Florists, Greenhouses and Fine Stationery. You’ll also need storage for tools, pots and soil. You can buy prefab potting stations at gardening and hardware stores, or you can create your own. Sturtz hired local craftsmen to build its potting areas, but personal touches can make a home potting station look less utilitarian. 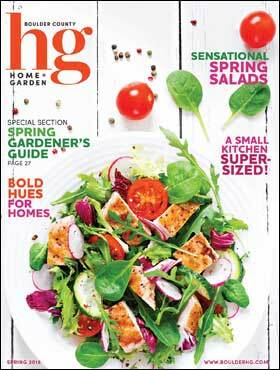 To gather inspiration for her potting station, Canada-based landscape blogger Anne Davis (www.designdreamsbyanne) perused images in magazines and online. When it comes to the overall look, she says, “Don’t be afraid to use unconventional items.” She used a fireplace screen and a window for the backing of her potting station. 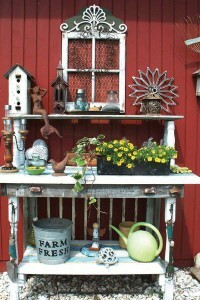 Even an old door can gussy up a potting area, and it’s a no-brainer for shelving. To give your station texture, incorporate things like stained glass, mirrors, corrugated metal and even ceiling tiles. Wind chimes and art can add another dimension. For whi msy, mix tools with keepsakes and mementos that you can swap out if you feel like it. “The fun thing about a potting bench is it can hold a lot of unique items and be functional at the same time,” says longtime gardener Sue Langley. With a few decorative items and splashes of color, you can make a potting station an attractive garden element that you’ll use often and enjoy. 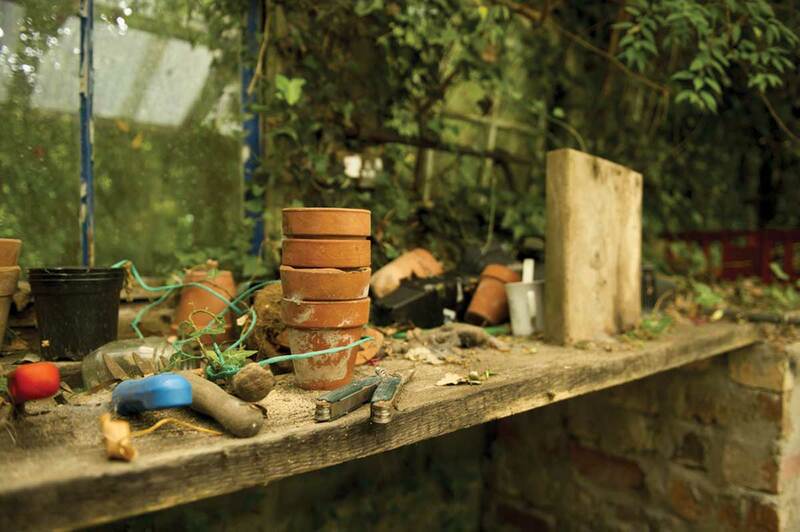 Potting stations can go just about anywhere, too. Perhaps against a fence, beside your house, beneath a tree, or freestanding in the yard. Just remember you’ll need afternoon shade and access to a garden hose. Davis used brick for her station’s base, but a dirt or gravel foundation would work well, too. Pine needles can help soften the standing area. Langley, who lives in the central California mountains, had a messy area outside a shed that needed clearing. She thought it might be the perfect spot for a potting station, so she posted a picture of the cluttered space on her website and asked how to transform it into a functional, yet stylish, potting spot. Langley took a suggestion of making two piles from the clutter—one with keepers, the other with throwaways and recyclables. In the keep pile were pieces that meant something to her, like a cart her dad once wheeled around to collect dug-up weeds, and her Bauer flowerpots—collectible 1950s California pottery with jewel tones reminiscent of Fiestaware. She also kept a few discarded windows and shutters she’d found, along with a mailbox, terra-cotta pots, galvanized tubs, wooden crates and some wood that was lying around. 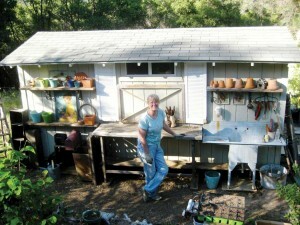 Langley used the shed for her -potting-station’s backdrop, centering a workbench her husband built from reclaimed wood against the side. Then she secured a wooden window frame and shutters to the bench for decoration, and added wooden shelves on either side. “Shelves are important for storing pots and keeping my work surface clear,” she says. 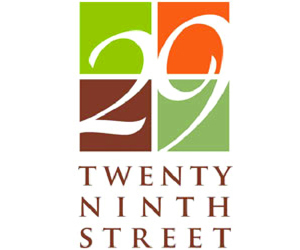 She put things she didn’t want the weather to affect, like gardening gloves and seed packets, inside the mailbox. “If you secure the mailbox to a post, it makes such a charming little dry–storage area,” she says. An antique Boraxo dispenser she bought on eBay hangs above the sink, and she plans to buy a special plumbing attachment for the found faucet so she can hook up a hose to rinse vegetables and other things. “I’ll just put a bucket beneath the sink to catch the water and then reuse it in the garden,” she says. She grows garlic and onions in two nearby galvanized tubs, which she also uses for starter plants and ones that need extra TLC. With a little elbow grease, Langley turned a “mess” into a cute, rustic potting station that has everything within reach. 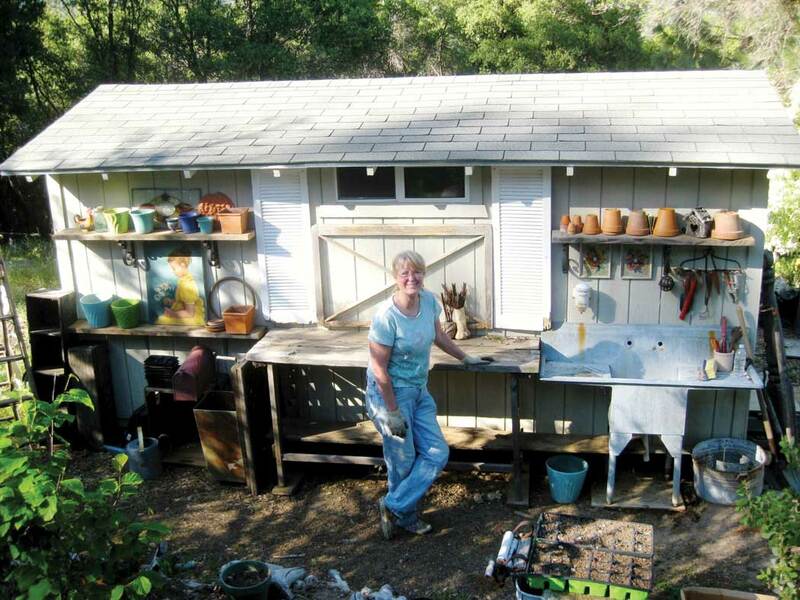 “I can work on several pots at a time and get all my planting done in one spot,” she says. “It’s useful and functional.” And when she needs a break, a blue Adirondack chair sits nearby.